Veterans Day afforded me a day off, not only to contemplate our vets (thanks to you ALL), but also to hike. My last hike, Sandwich Dome, was inspired by seeing the peak from Mt. Israel. This hike was the same. I saw Mt. Carrigain from the summit of Sandwich Dome, and then started reading up on it. 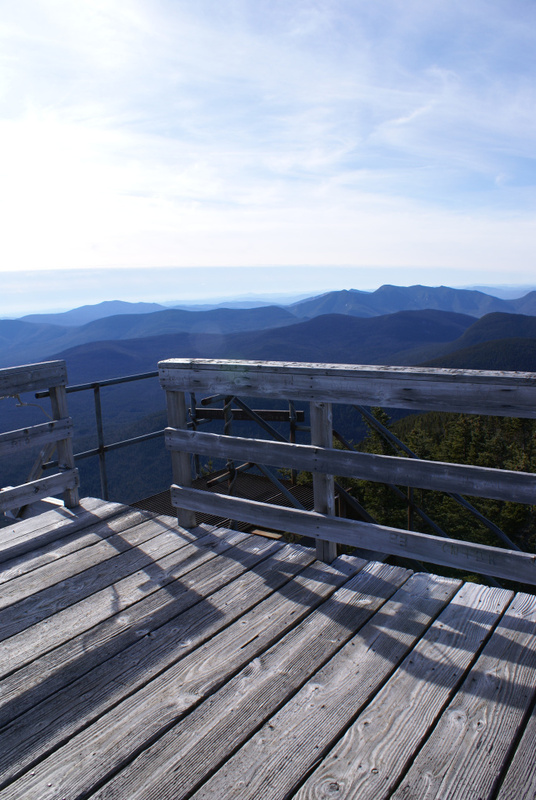 After finding out you can see 43 of the 48 4,000 footers from the observation deck at the summit of Carrigain (same as Washington), it became next on the list. I headed out in the dark from the house, about 90 miles north to the trailhead. Along the way, I drove through Franconia Notch, Cannon and the Kinsmans on my left, Lafayette, Lincoln, Liberty, and Flume on my right. Then on through Crawford Notch, largely in the shadow of Mt. Washington’s mighty prominence, antennas and summit towers silhouetted in the dawn light. I have a visual memory etched in my mind of the Mt. Washington Hotel, looming and white off to my left in Bretton Woods as I drove by. 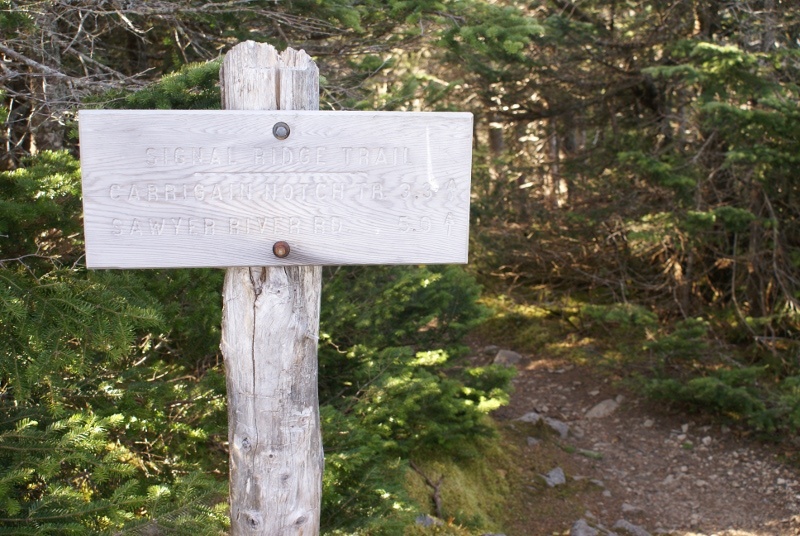 Signal Ridge Trail is the most frequented path to the summit of Mt. Carrigain, and the only way if you want to do an in-and-out in one day. Sawyer River Road, a narrow, well-graded dirt road a couple of miles from Bartlett, NH off of Rt. 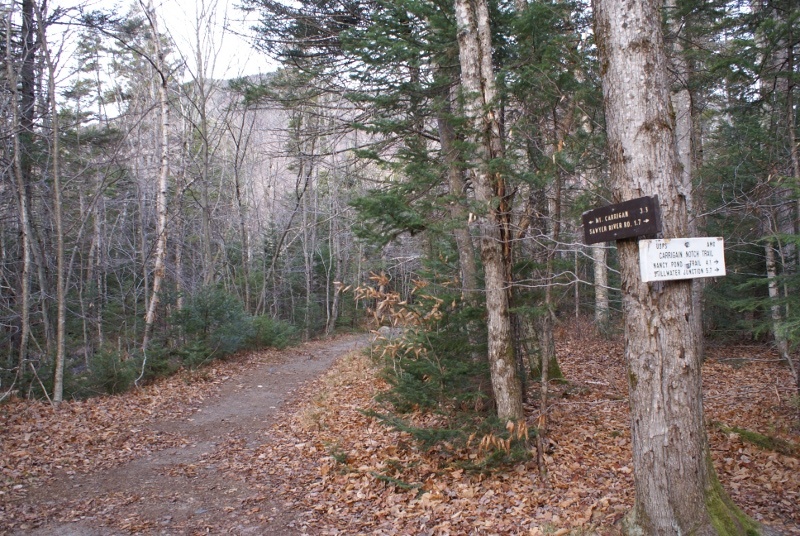 302, provides easy access and a decent parking area to the trailhead, although it is gated shut once the snow sets in. I began the 5 mile trek to the summit about 7:10a. The first couple of miles were easy grades, with a few stream crossings to keep it interesting. A good bit in the beginning parallels Whiteface Brook; the sounds of rushing water accompanied my feet crunching through the leaves…lots of leaves. Leaves from beech, ash, or maybe both had piled up boot-deep and deeper so that I couldn’t see the rocks underneath. Not a problem for the most part, but an unseen rock or two caused the odd stumble. Once past those first two miles, the work began in earnest. 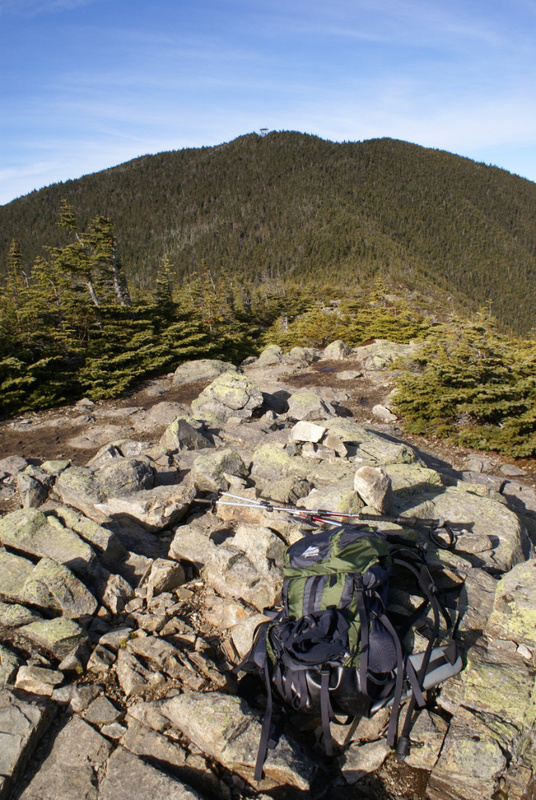 From about 2,000 feet, the trail ascended steadily, steeply at times, with lots of rocks all the way to signal ridge. I got glimpes back towards Crawford Notch at times through the trees, but mostly all I got was a tease of the views to come. Around 4,450 feet, I popped out onto Signal Ridge, finally, after about 2.5 hours. Another 30 minutes, and I made the summit, where an observation deck awaited. The views were indeed awe-inspiring. 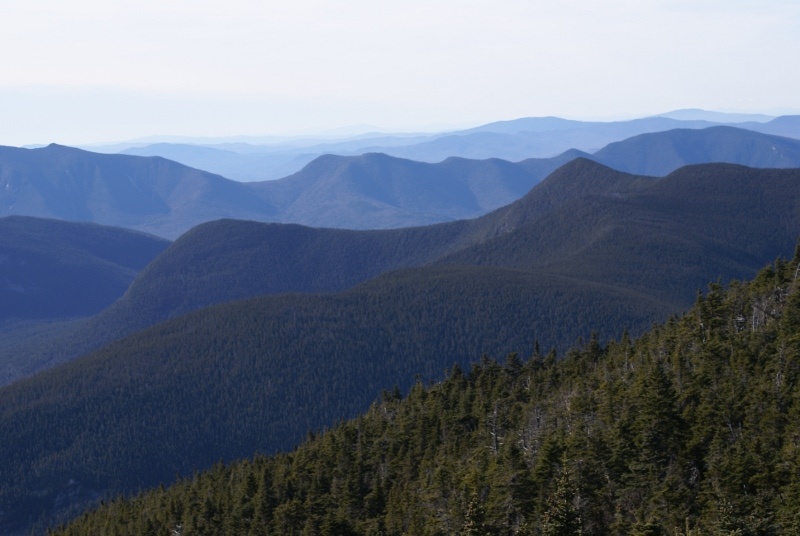 I could see a long way in all directions, more peaks than I could possibly identify, although I’m getting better at discerning the outlines of certain mountains and ridgelines. I also made a feathered friend. The descent was a challenge. I did something to my right knee. I don’t know what exactly, or when. I had no issues on the ascent, and clambering around the observation deck was no problem. But not 500 feet down the trail, I felt a little twinge during certain steps. 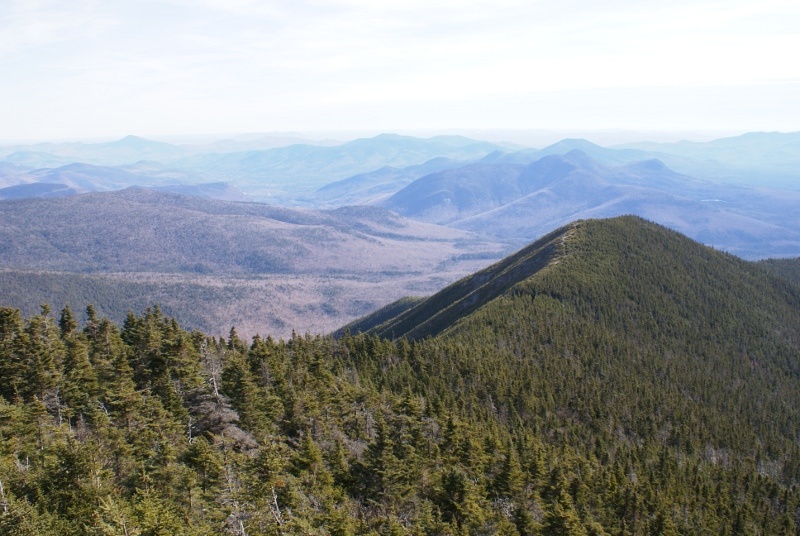 By the time I crossed the half-mile back to Signal Ridge, it was a more than a little twinge. Then it got worse. A twinge became a tweak. A tweak became a sharp pain if I hit it wrong, and I had a long way to descend. I figured out that I could sidestep in a certain way, and lean heavier on my trekking poles to take the edge off of the discomfort. I also found that level ground was completely tolerable, with hardly any discomfort at all. Ah, well. The knee was a bummer, but it didn’t wreck my day. I was still able to enjoy the descent overall. I had to stop a lot more than normal, but that wasn’t a bad thing. When I’m stumping through the woods, there’s a lot of noise generated: boots crunching whatever is underfoot, compression straps creaking, water sloshing about, breathing heavily, etc. Stopping gives me the change to listen to what’s going on the woods around me. Critters scampering. Birds fluttering. Water flowing. God’s creation left to itself. 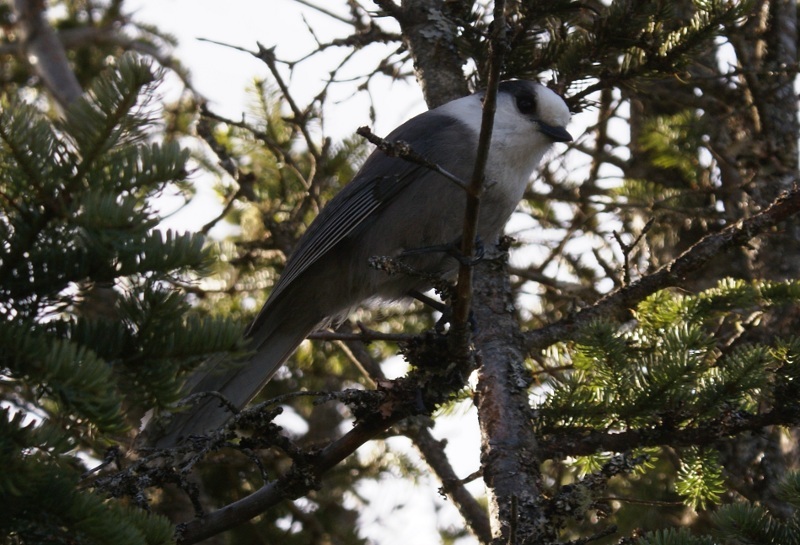 And…on this particular day…an odd noise I’d never heard before, sort of a clicking, flapping noise that I thought might be some woodland inhabitant scolding for an offense as yet unclear to me. But no. I looked around enough, and finally saw overhead strips of birch bark unfurled from the trunks, fluttering in the breeze, making noise as they moved about. 10 miles is a long hike under any circumstances, but the knee made me particularly glad to get back to the car. What a hike, though. My knee is still bothering me, but 24 hours later, it’s getting better. So without further ado, the pictures. Enjoy…I did! Signal Ridge + Carrigain Notch trail junction, about 1.7 miles in. Mt. 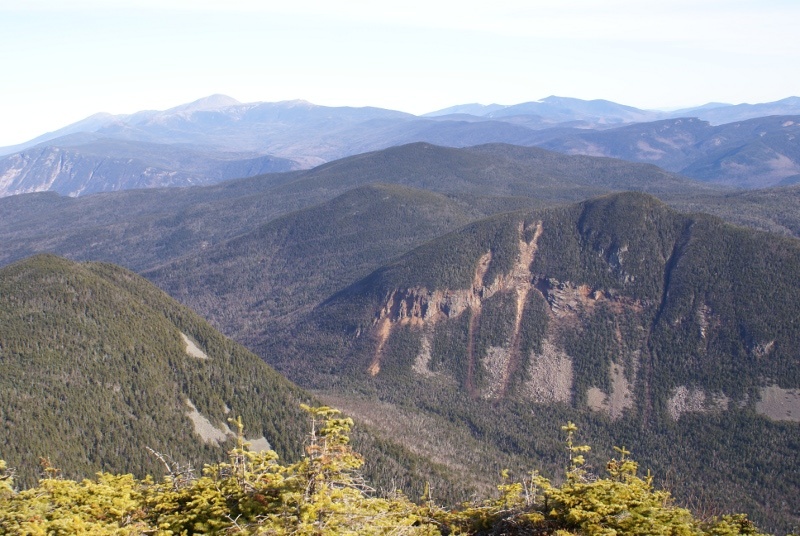 Lowell to the center right seen from Signal Ridge. Carrigain Summit observation deck about 0.5 miles as seen from Signal Ridge. Looking back to Signal Ridge from Carrigain Summit. 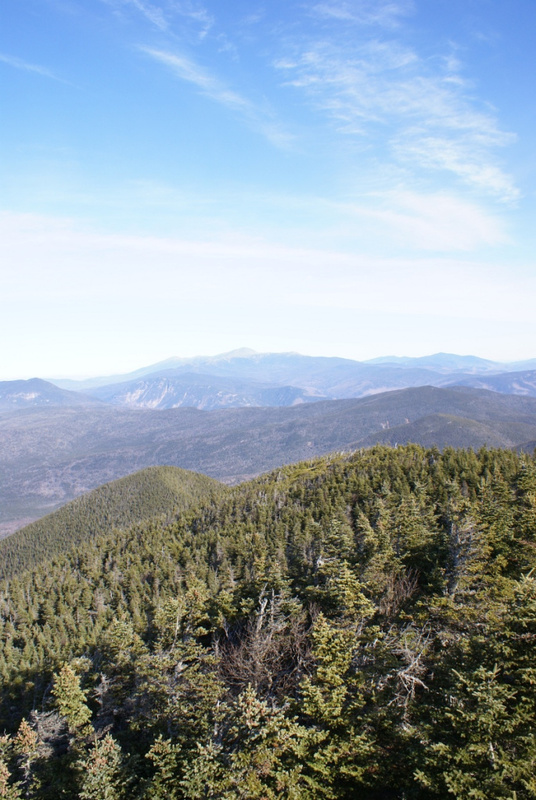 Presidential range, Mt. Washington in the center, from Carrigain Summit. 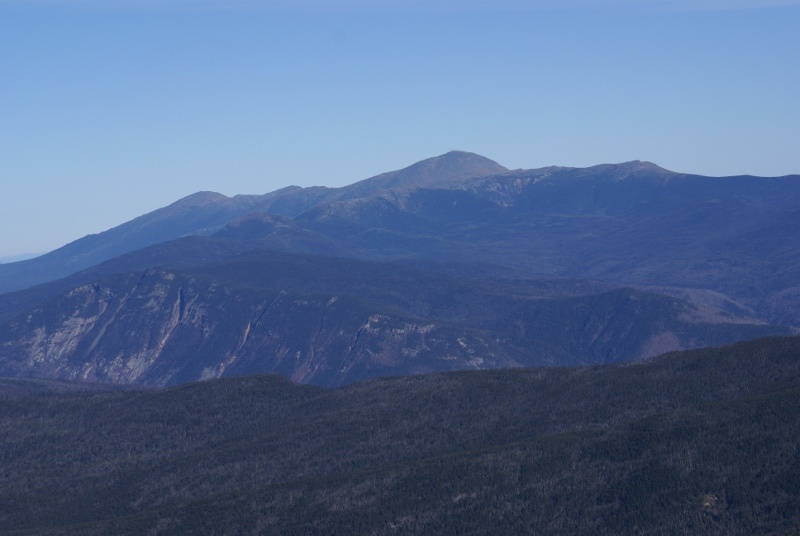 Wide-angle shot of Presidentials, viewed from Mt. Carrigain summit. Mt. 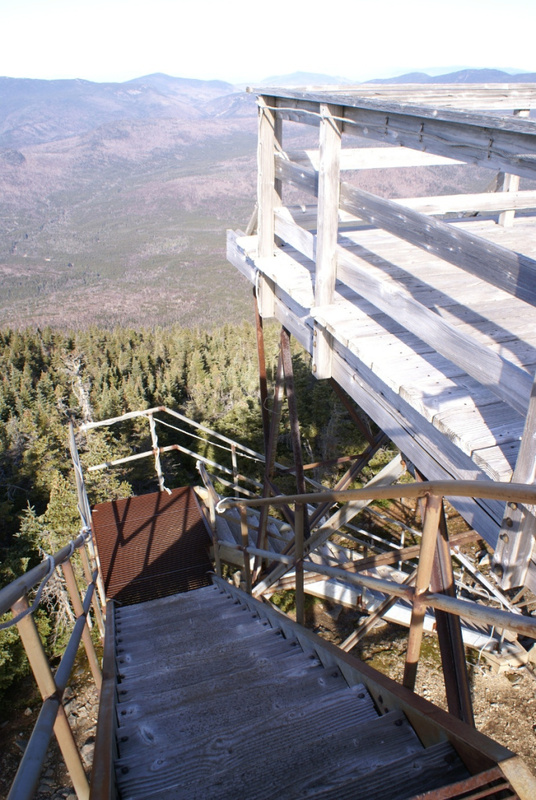 Carrigain observation platform – down the stairs. 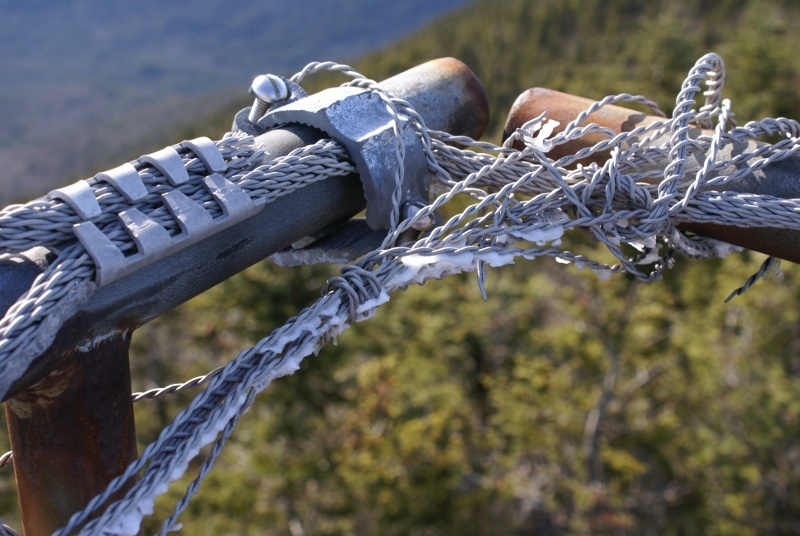 The only ice I saw all day was on these cables at the Carrigain platform. Southerly view from Mt. Carrigain summit. This fellow visited me at the summit of Mt. Carrigain. He wasn’t shy. Another shot of the Mt. Carrigain platform. 5 miles back to Sawyer River Road from the summit of Mt. Carrigain.